2018 marks the end of this generation of the Toyota RAV4 compact crossover. An all-new model was introduced for 2019 as the next generation of the vehicle. As a last hurrah, Toyota added a new Adventure grade for the 2018 RAV4 and we kinda like it. 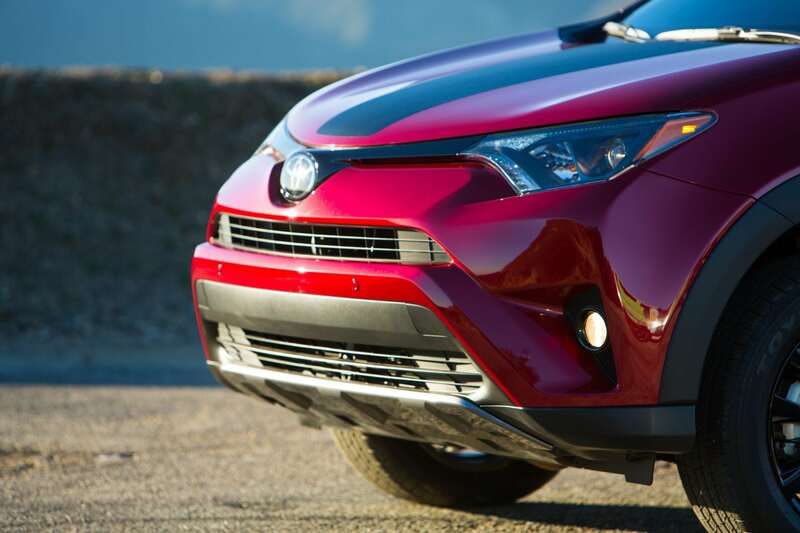 The 2018 Toyota RAV4 hasn’t changed much since its introduction for this generation. Its goal of delivering value and well-rounded versatility is the focus and somewhat polarizing exterior looks make it stand out from the crowded compact crossover field. The Adventure trim accentuates this latter point, adding more aggression to the RAV4. Inside, the 2018 RAV4 retains its five-seat configuration with generous cargo space and high safety ratings. The 2018 Toyota RAV4 has a total of six trim levels, all of which use the same drivetrain configuration. The Toyota RAV4 Hybrid model is reviewed separately. Our focus in this review is on the Adventure trim, but all trim levels are included here for reference. 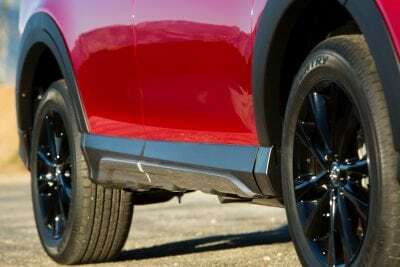 LE – The base trim for the 2018 RAV4 comes equipped with 17-inch steel wheels, a rearview camera, a 60/40 split-bench rear seat, a 6.1-inch touchscreen infotainment interface, a USB port, and a full suite of Toyota Safety Sense P technologies. Those include forward collision warning with automatic emergency braking, lane keeping assistance, adaptive cruise control, and automatic high beams. 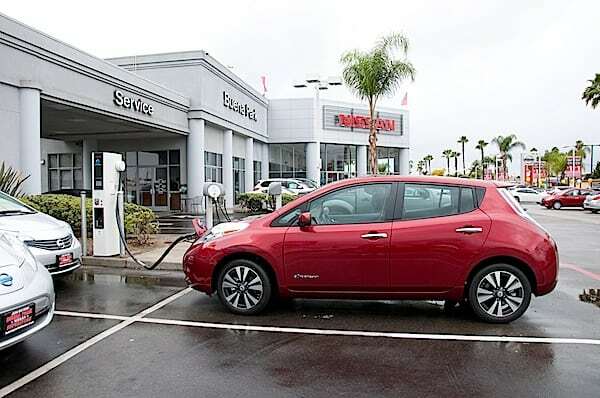 XLE – This trim builds on the base model, adding alloy wheels, fog lamps, heated side mirrors, added interior trim materials, a sunroof, dual-zone automatic climate control, and a leather-wrapped steering wheel. Adventure – Is very similar to the XLE, but with added styling points and a higher ride height. The Adventure has about half an inch of added clearance, 18-inch alloy wheels, larger fender flares, all-weather floor mats, a leather-wrapped shift knob, and a 120V outlet in the cargo area. Exclusive access to the Cold Weather package (heated front seats, power driver seat, heated steering, windshield wiper de-icer) is available for the Adventure grade. 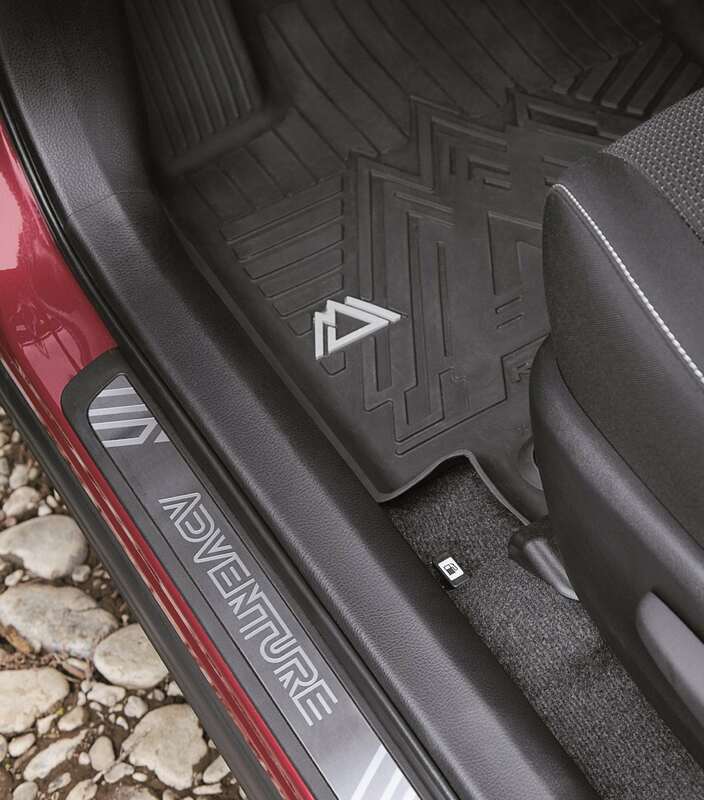 Adventure logos are found all around inside and outside of the RAV4 in this trim. SE – Receives a few of the Adventure model’s styling cues, including the higher ride height and wider fenders. It also adds automatic LED headlamps, LED daytime running lights, LED tail lamps, 18-inch silver alloy wheels, an upgraded rearview camera, shift paddles, heated front seats, simulated leather upholstery, and tighter suspension tuning. Limited – upgrades from the XLE to include comfort items from the SE as well as more wheel options and chrome exterior trim items. It adds a height-adjustable power liftgate, blind-spot and rear cross-traffic warning systems, keyless ignition/entry, driver’s seat memory, an auto-dimming rearview mirror, and a 7-inch touchscreen with Entune Premium Audio and navigation. Platinum – Adds all of the options for the Limited model, such as the hands-free liftgate, a 360-degree parking camera, heated steering wheel, the Entune Premium JBL Audio and App Suite package, and some prettier exterior trim items. As the trim list above shows, the 2018 Toyota RAV4 Adventure sits just below the mid-point for the RAV4’s trim options. On the outside, in our opinion, the RAV4 Adventure is the best-looking of the RAV4 models for 2018. The hood stripe, added height, larger fenders, and more rugged appeal are great for the crossover. They also serve to soften some of the bulbous, edge-prone design elements of the 2018 RAV4 that are polarizing to many (including us). What we aren’t too happy with is the Adventure grade’s relatively cheap feel inside, which isn’t made up for with the heavy-handed branding of the mountain peak logo design for the trim. They’re everywhere. For utilitarian drivers, the non-upgraded RAV4 Adventure has everything needed for a good daily drive and occasional weekend fun machine. Upgrades available help to soften the cheap feeling inside by adding some creature comforts. We like the winter packaging (given our climate here) and would recommend the premium audio upgrade option as well, which adds more usefulness to the infotainment and better sound quality from the stereo. That last point is important as the RAV4 Adventure can be a bit loud on the highway, especially if equipped with winter tires (as our test model was). 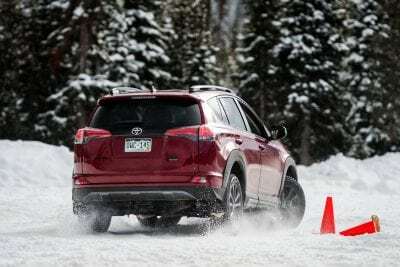 Those winter tires add a whole new dimension of bad weather excellence, however, and were a real boon to the 2018 RAV4 when we drove it at an ice driving event in Colorado earlier this year. 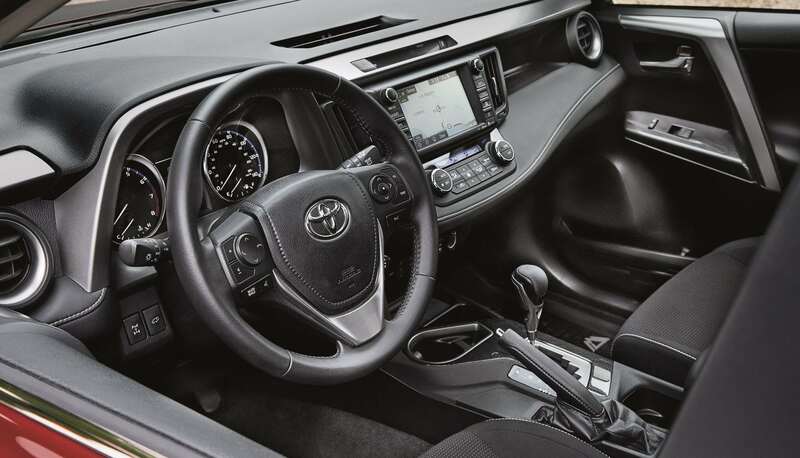 The interior of the 2018 Toyota RAV4 is hit and miss otherwise, with throwback elements like the oddly-shaped dashboard, useless cup holder ahead of the shift knob, and lower-grade seat bolstering (in the Adventure). We like the large amount of open passenger space, which accommodates up to five, and the very usable cargo area. With the rear seats up, the RAV4’s cargo space is a spacious 38.4 cubic feet with lots of that being floor room and with the rear seats folded it expands to 73.4 cubes. We do note that the rear seats, even in the lower-end Adventure, don’t fold completely flat. Most items like bicycles and the like will fit easily in the RAV4, though. We managed to get an entire twin bed (frame and mattress) into the crossover without much trouble. 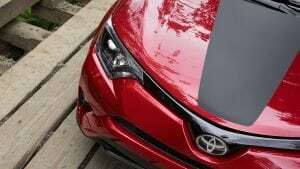 The 2018 Toyota RAV4 is powered by a 2.5-liter naturally-aspirated four-cylinder engine that is mated to a well-done, but boring six-speed automatic transmission. The focus in the RAV4 is on fuel economy, not performance, with the engine’s top-most 176 horsepower coming at a relatively high RPM rate. Fuel economy in the 2018 RAV4 Adventure is pretty good with the front-wheel drive model (yes, there is one; no, it doesn’t seem to make sense) offering 23 mpg in the city and 29 mpg on the highway. The all-wheel drive option lowers those numbers to 22/28 city/highway. We saw about 21 mpg overall in our week with the RAV4 Adventure in AWD. A bit lower than the EPA ratings, but not bad for our high altitude (5,400 feet) and in a vehicle equipped with winter tires. 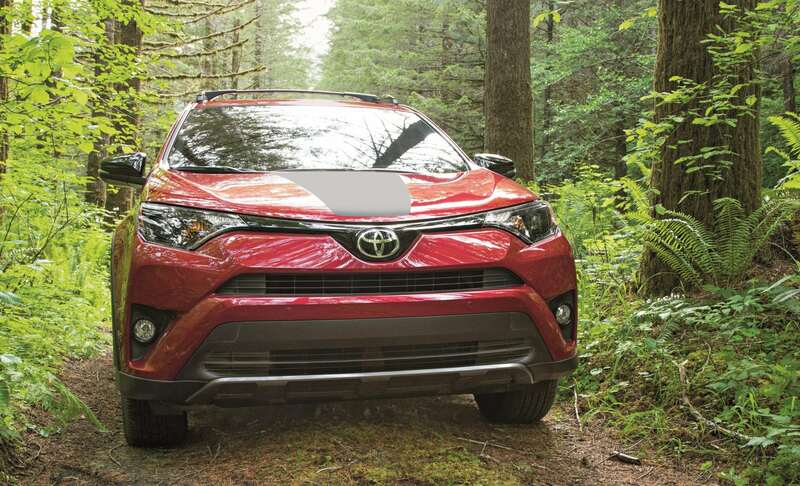 Around town, the 2018 Toyota RAV4 feels confident and does well getting around. It’s maneuverable and good at getting from A to B without fuss. These are the basic expectations of a compact crossover. 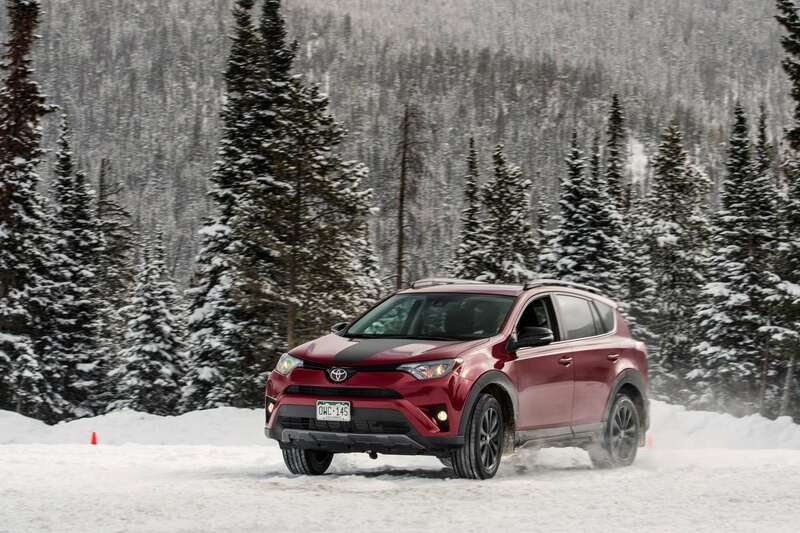 On the highway, though, the RAV4’s weaknesses begin to show as the highway noise, not-as-comfortable seating, and lackluster performance are noted. On the up side, there’s never a reason to feel worried in the 2018 RAV4 as its top-notch safety ratings, class-leading standard safety equipment, and solid reputation are all boons. 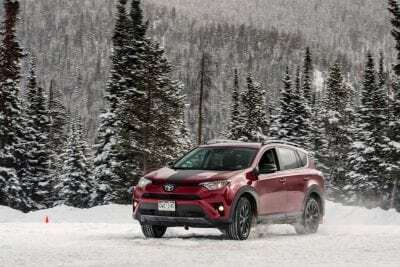 The compact crossover segment is the fastest-growing in North America and the 2018 RAV4 Adventure is an aged design compared to other offerings. It still does well, though. Ford Escape – Has plenty of family friendliness, a good drive quality, and excellent fuel economy from several engine options. Hyundai Tucson – Is a solid drive with a great engine/transmission combination, excellent warranty, and good daily use metrics. Mazda CX-3 or CX-5 – Both of these Mazda models are sportier and more fun to drive than is the RAV4. They’re also more comfortable. Neither, however, offers the styling and unusually aggressive appeal of the Adventure grade. 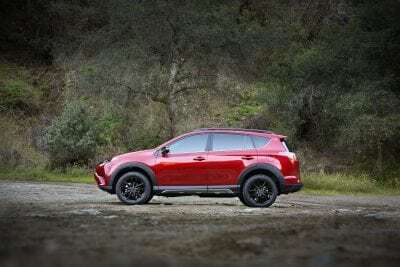 Nissan Rogue Sport – New from Nissan, the Rogue Sport is a two-row, slightly smaller version of the Rogue with a lot of European appeal to its interior and plenty of goodness in every other respect. The 2018 Toyota RAV4 Adventure offers a fun package for the generally well-done RAV4 model. For the money spent, it’s not as good as might be had in the SE model, though, and shoppers should compare closely. As it is, though, the 2018 RAV4 is a competitive compact crossover despite its age. 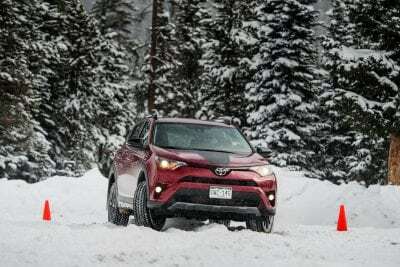 The RAV4 Adventure was a manufacturer’s press loan for about a week, during which time a total of over 250 miles were put on the crossover in varied weather conditions with various passenger loads. The vehicle was also driven at a sponsored ice driving event in Colorado for a day.